COVRI Password Reset Web Part for Microsoft® SharePoint® 2010 allows end users to reset their own Local NT or Active Directory password with in SharePoint environment without administrator intervention. It also notifies end users after their password is reset. 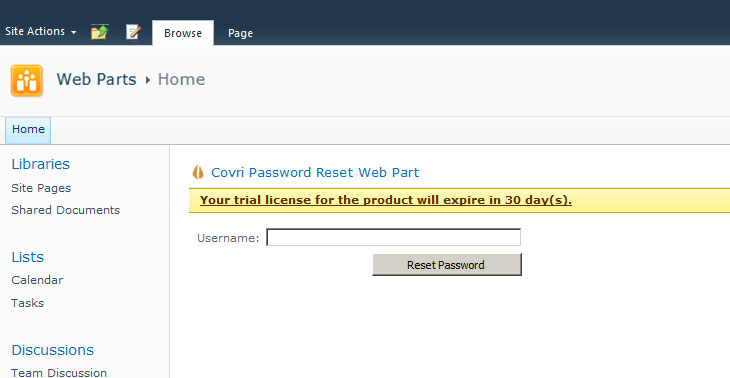 COVRI SharePoint Password Reset Web Part allows users (AD, Local NT, or Form-Authenticated) to Reset their own passwords from SharePoint without administrator intervention. Before using Password Reset Web Part it is required to activate COVRI Password Reset Web Part site collection feature and specify Password Reset global settings for each Web application Zone. In Authentication Type section, you can see current Web application Zone (for which password reset is configured), Web application URL and authentication type for this zone. In order to enable password reset for current zone, check Yes under Allow password reset for this zone?. If No is selected, then Password Reset Web Part will not be visible for this zone. If current zone authentication uses Active Directory users (Windows authentication or FBA with LDAP membership provider), then it is required to provide administrative account, that has a right to reset AD users passwords. If you want to use security questions to validate AD user identity, check Enable Security Questions and specify at least one security question. You should set question displayed in the Web Part and define the field in Active Directory that the user’s answer is confirmed against. Note: This flag is auto determined for FBA membership providers (except LDAP membership provider), and depends on provider's RequiresQuestionAndAnswer property. If RequiresQuestionAndAnswer is set to true, then user should answer a password question for password reset. In order to send confirmation email before password reset, you should check Enable Email Confirmation option. You can change default message displayed for user in web part and confirmation email Subject and Body. You can use the following key templates in email fields: $USERNAME$,$USEREMAIL$, $CONFIRMLINK$. Note: If FBA membership providers (except LDAP membership provider) has RequiresQuestionAndAnswer equal to True and EnablePasswordRetrival is equal to False, then this option will be disabled in this case. Generate new password automatically and show it on page – new password will be generated automatically and will be shown via Web Part. $USERNAME$, $USEREMAIL$,$NEWPASSWORD$ template keys are supported as well. Generate new password automatically and send it via email – new password will be generated automatically and email will be sent to user email account with new password.$USERNAME$, $USEREMAIL$, $NEWPASSWORD$ template keys can be used in email subject and body. Enable to type new password manually – users will be able to type new password and confirm it manually via Web Part interface. In order to avoid any security issues, you can check Send email notification on password changed. As soon as new password is generated or user types new one manually, system will send email notification to user email address just inform that his password has been changed. If user account is locked due to AD password policy violations (for ex. an incorrect password was entered three times when user logins), user can be unlocked automatically. For it, you should check Unlock account automatically option in Additional Settings section. In order to access to the Web page for the users, that forgot their passwords, you should enable anonymous access for SharePoint site. After you have enabled anonymous access to Web application, you should enable it for your SharePoint site collections that needs password reset. For that, open SharePoint site and go to Anonymous Access settings page (Site Actions --> Site Permissions --> Anonymous Access). In Anonymous Access section, specify the parts of SharePoint site that anonymous users can access. If you select Entire Web site, anonymous users will be able to view all pages in your Web site and view all lists and items which inherit permissions from the Web site. If you select Lists and libraries, anonymous users will be able to access pages and view items only for those lists and libraries that have enabled permissions for anonymous users. In order to use COVRI Password Reset web part it is enough to select List and libraries option under Anonymous users can access box. Select Edit Web Part from web part menu. In order to configure/change configuration of Web part settings either click open password reset settings page link or click from the web part pane Click here to open Password Reset settings and make the required changes as explained above. To reset password enter username/email as specified in web part settings and click reset password. Answer the questions as specified in web part settings and click continue. Password Reset Web Part Version 1.0 released on 8th October 2013.